"Nabataean" redirects here. For the languages, see Nabataean Arabic and Nabataean Aramaic. 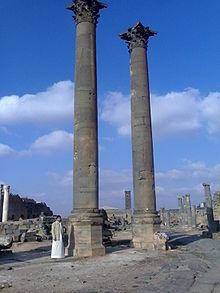 The Nabataeans, also Nabateans (/ˌnæbəˈtiːənz/; Arabic: ٱلْأَنْبَاط‎ al-ʾAnbāṭ , compare Ancient Greek: Ναβαταῖος, Latin: Nabataeus), were an Arab people who inhabited northern Arabia and the Southern Levant. Their settlements, most prominently the assumed capital city of Raqmu (present-day Petra, Jordan) gave the name of Nabatene to the borderland between Arabia and Syria, from the Euphrates to the Red Sea. Their loosely controlled trading network, which centered on strings of oases that they controlled, where agriculture was intensively practiced in limited areas, and on the routes that linked them, had no securely defined boundaries in the surrounding desert. Having maintained territorial independence from their emergence in the 4th century BC until Nabataea was conquered by Trajan in 106 AD, annexing it to the Roman Empire. Nabataeans' individual culture, easily identified by their characteristic finely potted painted ceramics, was adopted into the larger Greco-Roman culture. They were later converted to Christianity during the Byzantine Era. Jane Taylor, a writer, describes them as "one of the most gifted peoples of the ancient world". The Nabataeans were one among several nomadic tribes which roamed the Arabian Desert, moving with their herds to wherever they could find pasture and water. These nomads became familiar with their area as seasons passed, and they struggled to survive during bad years when seasonal rainfall diminished. Although the Nabataeans were initially embedded in Aramaic culture, modern scholars reject theories about their having Aramean roots. Instead, historical, religious and linguistic evidence identifies them as a northern Arabian tribe. The precise origin of this specific tribe of Arab nomads remains uncertain. One hypothesis locates their original homeland in today's Yemen, in the south-west of the Arabian peninsula; however, their deities, language and script share nothing with those of southern Arabia. Another hypothesis argues that they came from the eastern coast of the Peninsula. The suggestion that they came from Hejaz area is considered by Michele Murray to be more convincing, as they share many deities with the ancient people there, and "nbtw", the root consonant of the tribe's name, is found in the early Semitic languages of Hejaz. Similarities between late Nabataean Arabic dialect and the ones found in Mesopotamia during the Neo-Assyrian period, and the fact that the Assyrians listed a group with the name of "Nabatu" as one of several rebellious Arab tribes in the region, suggests a connection between the two. The Nabataeans might have originated from there and migrated west between the 6th and 4th centuries BCE into northwestern Arabia and much of what is now Jordan. Nabataeans have been falsely associated with other groups of people. A people called the "Nabaiti" who were defeated by the Assyrian king Ashurbanipal and described[by whom?] as living "in a far off desert where there are no wild animals and not even the birds build their nests", were associated by some[which?] with the Nabataeans due to the temptation to link their similar names and images. One claim by Jane Taylor alleges a misconception in their identification with the Nebaioth of the Hebrew Bible, the descendants of Ishmael, Abraham's son. Unlike the rest of the Arabian tribes, the Nabataeans later emerged as vital players in the region[which?] during their times of prosperity. However, they later faded and were forgotten. The brief Babylonian captivity of the Hebrews that began in 586 BCE opened a minor power vacuum in Judah (prior to the Judaeans' return under the Persian King, Cyrus the Great, who reigned 559-530 BCE). As Edomites moved into open Judaean grazing lands, Nabataean inscriptions began to appear in Edomite territory. The first definite appearance dates from 312/311 BCE, when they were attacked at Sela or perhaps at Petra without success by Antigonus I's officer Athenaeus in the course of the Third War of the Diadochi; at that time Hieronymus of Cardia, a Seleucid officer, mentioned the Nabataeans in a battle report. About 50 BCE, the Greek historian Diodorus Siculus cited Hieronymus in his report,[clarification needed] and added the following: "Just as the Seleucids had tried to subdue them, so the Romans made several attempts to get their hands on that lucrative trade." The Nabataeans had already some trace of Aramaic culture when they first appear in history. They wrote a letter to Antigonus in Syriac letters, and Aramaic continued as the language of their coins and inscriptions when the tribe grew into a kingdom and profited by the decay of the Seleucids to extend its borders northward over the more fertile country east of the Jordan river. They occupied Hauran, and in about 85 BCE their king Aretas III became lord of Damascus and Coele-Syria. Proper names on their inscriptions suggest that they were ethnically Arabs who had come under Aramaic influence. Starcky identifies the Nabatu of southern Arabia (Pre-Khalan migration) as their ancestors. However, different groups amongst the Nabataeans wrote their names in slightly different ways; consequently archaeologists are reluctant to say that they all belonged to the same tribe, or that any one group represents the original Nabataeans. Many examples of graffiti and inscriptions—largely of names and greetings—document the area of Nabataean culture, which extended as far north as the north end of the Dead Sea, and testify to widespread literacy; but except for a few letters no Nabataean literature has survived, nor was any noted in antiquity. Onomastic analysis has suggested that Nabataean culture may have had multiple influences. Classical references to the Nabataeans begin with Diodorus Siculus; they suggest that the Nabataeans' trade routes and the origins of their goods were regarded as trade secrets, and disguised in tales that should have strained outsiders' credulity. Diodorus Siculus (book II) described them as a strong tribe of some 10,000 warriors, pre-eminent among the nomads of Arabia, eschewing agriculture, fixed houses, and the use of wine, but adding to pastoral pursuits a profitable trade with the seaports in frankincense, myrrh and spices from Arabia Felix (today's Yemen), as well as a trade with Egypt in bitumen from the Dead Sea. Their arid country was their best safeguard, for the bottle-shaped cisterns for rain-water which they excavated in the rocky or clay-rich soil were carefully concealed from invaders. The extent of Nabataean trade resulted in cross-cultural influences that reached as far as the Red Sea coast of southern Arabia. The gods worshipped at Petra were notably Dushara and Al-‘Uzzá. Dushara was the supreme deity of the Nabataean Arabs, and was the official god of the Nabataean Kingdom who enjoyed special royal patronage. His official position is reflected in multiple inscriptions that render him as "The god of our lord" (The King). The name Dushara is from the Arabic "Dhu ash-Shara": which simply means the one of Shara, Mountain south-east of Petra. Therefore, from Nabataean perspective, Dhushara was probably associated with the heavens. However one theory connect Dhushara with the forests that give different idea of the god. 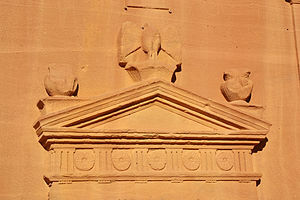 The eagle was one of the symbols of Dushara. It was widely used in Hegra as a source of protection for the tombs against thievery. Nabataean inscription from Hegra, give us an understanding of the cosmic function of Dushara: "He who separates night and day" suggest that he was linked with the sun, or with Mercury, which another Arabian god, called Ruda, was identified with. "His throne" was frequently mentioned in inscriptions, certain interpretations of the text consider it as a reference for Dhushara's wife, goddess Harisha. She was probably a solar deity. Although when the Romans annexed the Nabataean Kingdom, Dushara still acquired important role despite losing his former royal privilege. The greatest testimony to the status of the god after the fall of the Nabataean Kingdom is in the 1000th anniversary of Rome where Dushara was celebrated in Bostra by strucking coins in his name that was called Actia Dusaria (linking the god with Augustus victory at Actium). He was venerated in his Arabian name with a Greek fashion and in a reign of an Arabian emperor. The Nabataeans used to represent their gods as featureless pillars or blocks. Their most common monuments to the gods, commonly known as "god blocks", involved cutting away the whole top of a hill or cliff face so as to leave only a block behind. However, the Nabataeans became so influenced by other cultures such as those of Greece and Rome that their gods eventually became anthropomorphic and were represented with human features. The Nabataeans spoke a form of Arabic, however for their inscriptions, they used the Aramaic under heavy influence from Arabic forms and words demonstrated in numerous Nabataean inscriptions, which reflect the local tongue of the Nabataeans. For medium and mutually comprehensive communication with Middle Eastern ethnic groups the Nabataeans, like their neighbours, had to rely on Aramaic as a bridge between the different polities of the region. Therefore, Aramaic was used for commercial and official purposes across the Nabataean political sphere. The Nabataean alphabet itself also developed out of the Aramaic alphabet, although it used a distinctive cursive script from which the Arabic alphabet emerged. There are different opinions concerning the development of the Arabic script. J. Starcky considers the Lakhmids' Syriac form script as a probable candidate. However John F. Healey states that: "The Nabataean origin of the Arabic script is now almost universally accepted". While the principal inscriptional language of the Nabataeans was Aramaic, the lingua franca of the time, the Nabataeans were, however, Arabic speakers. In surviving Nabataean documents, Aramaic legal terms are followed by their equivalents in Arabic. This could suggest that the Nabataeans used Arabic in their legal proceedings, but recorded them in Aramaic. Although not as dry as at present, the area occupied by the Nabataeans was still a desert and required special techniques for agriculture. One was to contour an area of land into a shallow funnel and to plant a single fruit tree in the middle. Before the 'rainy season', which could easily consist of only one or two rain events, the area around the tree was broken up. When the rain came, all the water that collected in the funnel would flow down toward the fruit tree and sink into the ground. The ground, which was largely loess, would seal up when it got wet and retain the water. In the mid-1950s, a research team headed by Michael Evenari set up a research station near Avdat (Evenari, Shenan and Tadmor 1971). He focused on the relevance of runoff rainwater management in explaining the mechanism of the ancient agricultural features, such as terraced wadis, channels for collecting runoff rainwater, and the enigmatic phenomenon of "Tuleilat el-Anab". Evenari showed that the runoff rainwater collection systems concentrate water from an area that is five times larger than the area in which the water actually drains. Another study was conducted by Y. Kedar[who?] in 1957, which also focused on the mechanism[vague] of the agriculture systems, but he studied soil management, and claimed that the ancient agriculture systems were intended to increase the accumulation of loess in wadis and create an infrastructure for agricultural activity. This theory has also been explored by E. Mazor,[who?] of the Weizmann Institute of Science. Petra was rapidly built in the 1st century BCE, and developed a population estimated at 20,000. The Nabataeans were allies of the first Hasmoneans in their struggles against the Seleucid monarchs. They then became rivals of the Judaean dynasty, and a chief element in the disorders that invited Pompey's intervention in Judea. According to historian Paul Johnson, many Nabataeans were forcefully converted to Judaism by Hasmonean king Alexander Jannaeus. It was this king who, after putting down a local rebellion, invaded and occupied the Nabataean towns of Moab and Gilead and imposed a tribute of an unknown amount. Obodas I knew that Alexander would attack, so was able to ambush Alexander's forces near Gaulane destroying the Judean army (90 BC). 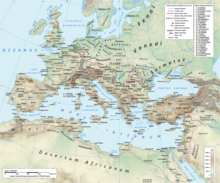 The Roman military was not very successful in their campaigns against the Nabataeans. In 62 BCE, Marcus Aemilius Scaurus accepted a bribe of 300 talents to lift the siege of Petra, partly because of the difficult terrain and the fact that he had run out of supplies. Hyrcanus II, who was a friend of Aretas, was despatched by Scaurus to the King to buy peace. In so obtaining peace, King Aretas retained all his possessions, including Damascus, and became a Roman vassal. In 32 BCE, during King Malichus II's reign, Herod the Great, with the support of Cleopatra, started a war against Nabataea. The war began with Herod plundering Nabataea with a large cavalry force, and occupying Dium. After this defeat, the Nabataean forces amassed near Canatha in Syria, but were attacked and routed. Cleopatra's general, Athenion, sent Canathans to the aid of the Nabataeans, and this force crushed Herod's army, which then fled to Ormiza. One year later, Herod's army overran Nabataea. After an earthquake in Judaea, the Nabateans rebelled and invaded Israel, but Herod at once crossed the Jordan river to Philadelphia (modern Amman) and both sides set up camp. The Nabataeans under Elthemus refused to give battle, so Herod forced the issue when he attacked their camp. A confused mass of Nabataeans gave battle but were defeated. Once they had retreated to their defences, Herod laid siege to the camp and over time some of the defenders surrendered. The remaining Nabataean forces offered 500 talents for peace, but this was rejected. Lacking water, the Nabataeans were forced out of their camp for battle, but were defeated in this last battle. An ally of the Roman Empire, the Nabataean kingdom flourished throughout the 1st century. Its power extended far into Arabia along the Red Sea to Yemen, and Petra was a cosmopolitan marketplace, though its commerce was diminished by the rise of the Eastern trade-route from Myos Hormos to Coptos on the Nile. Under the Pax Romana, the Nabataeans lost their warlike and nomadic habits and became a sober, acquisitive, orderly people, wholly intent on trade and agriculture. The kingdom was a bulwark between Rome and the wild hordes of the desert except in the time of Trajan, who reduced Petra and converted the Nabataean client state into the Roman province of Arabia Petraea. By the 3rd century, the Nabataeans had stopped writing in Aramaic and begun writing in Greek instead, and by the 5th century they had converted to Christianity. The new Arab invaders, who soon pressed forward into their seats, found the remnants of the Nabataeans transformed into peasants. Their lands were divided between the new Qahtanite Arab tribal kingdoms of the Byzantine vassals, the Ghassanid Arabs, and the Himyarite vassals, the Kindah Arab Kingdom in North Arabia. The city of Petra was brought to the attention of Westerners by the Swiss explorer Johann Ludwig Burckhardt in 1812. Mada'in Saleh in northwest Saudi Arabia. Shivta in the Negev Desert of Israel; disputed as a Nabataean precursor to a Byzantine colony. Dahab in South Sinai, Egypt; an excavated Nabataean trading port. ^ a b "Nabataeans". livius.org. Retrieved August 31, 2015. ^ "Herod | Biography & Facts". Encyclopedia Britannica. ^ "Solving the Enigma of Petra and the Nabataeans - Biblical Archaeology Society". Biblical Archaeology Society. 6 April 2017. ^ Bowersock, Glen Warren (1994). 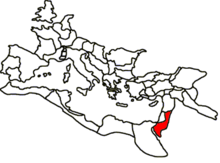 Roman Arabia. Harvard University Press. ISBN 9780674777569. ^ Catherwood, Christopher (2011). A Brief History of the Middle East. Little, Brown Book Group. ISBN 9781849018074. ^ Incorporated, Facts On File (2009). Encyclopedia of the Peoples of Africa and the Middle East. Infobase Publishing. ISBN 9781438126760. ^ a b c d e f g h Taylor, Jane (2001). Petra and the Lost Kingdom of the Nabataeans. London, United Kingdom: I.B.Tauris. pp. centerfold, 14. ISBN 978-1-86064-508-2. The Nabataean Arabs, one of the most gifted peoples of the ancient world, are today known only for their hauntingly beautiful rock-carved capital — Petra. ^ Maalouf, Tony (2003). Arabs in the Shadow of Israel: The Unfolding of God's Prophetic Plan for Ishmael's Line. Kregel Academic. ISBN 978-0-8254-9363-8. ^ Religion and the Nomadic Lifestyle: The Nabateans p. 217. ^ Marjo Lehtinen (December 2002) "Petra Papyri", Near Eastern Archaeology Vol.65 No.4 pp. 277–278. ^ Macdonald, M. C. A. (1999). "Personal names in the Nabataean realm: a review article". Journal of Semitic Studies. XLIV (2): 251–289. doi:10.1093/jss/xliv.2.251. Retrieved 7 February 2011. ^ a b Javier Teixidor (8 March 2015). The Pagan God: Popular Religion in the Greco-Roman Near East. Princeton University Press. p. 83. ISBN 978-1-4008-7139-1. ^ a b c d Jane Taylor (2001). Petra and the Lost Kingdom of the Nabataeans. I.B.Tauris. pp. 124–151. ISBN 978-1-86064-508-2. ^ a b Francisco del Río Sánchez (4 December 2015). Nabatu. The Nabataeans through their inscriptions. Edicions Universitat Barcelona. p. 118. ISBN 978-84-475-3748-8. ^ Rough Guides (1 November 2016). The Rough Guide to Jordan. Apa Publications. p. 395. ISBN 978-0-241-29849-7. ^ John F. Healey (1990). The Early Alphabet. University of California Press. p. 52. ISBN 978-0-520-07309-8. ^ Tony Maalouf. Arabs in the Shadow of Israel: The Unfolding of God's Prophetic Plan for Ishmael's Line. Kregel Academic. p. 172. ISBN 978-0-8254-9363-8. ^ Roger D. Woodard (10 April 2008). The Ancient Languages of Syria-Palestine and Arabia. Cambridge University Press. p. 2. ISBN 978-1-139-46934-0. ^ Arabic in Context: Celebrating 400 years of Arabic at Leiden University. BRILL. 21 June 2017. p. 79. ISBN 978-90-04-34304-7. ^ "A City Carved in Stone". Petra: Lost City of Stone. Canadian Museum of Civilization. 7 April 2006. Retrieved 7 February 2011. ^ Josephus 1:61, p. 48. ^ Josephus 1:363–377, pp. 75–77. ^ Josephus 1:377–391, pp. 78–79. ^ Rimon, Ofra. "The Nabateans in the Negev". Hecht Museum. Retrieved 7 February 2011. Graf, David F. (1997). Rome and the Arabian Frontier: From the Nabataeans to the Saracens. Aldershot: Ashgate. ISBN 978-0-86078-658-0. Healey, John F., The Religion of the Nabataeans: A Conspectus (Leiden, Brill, 2001) (Religions in the Graeco-Roman World, 136). Krasnov, Boris R.; Mazor, Emanuel (2001). The Makhteshim Country: A Laboratory of Nature: Geological and Ecological Studies in the Desert Region of Israel. Sofia: Pensoft. ISBN 978-954-642-135-7. Negev, Avraham (1986). Nabatean Archaeology Today. Hagop Kevorkian Series on Near Eastern Art and Civilization. New York: New York University Press. ISBN 978-0-8147-5760-4. Schmid, Stephan G. (2001). "The Nabataeans: Travellers between Lifestyles". In MacDonald, Burton; Adams, Russell; Bienkowski, Piotr (eds.). The Archaeology of Jordan. Sheffield, England: Sheffield Academic Press. pp. 367–426. ISBN 978-1-84127-136-1.